The Trump administration's management chief on Friday directed the federal agencies that have been closed during the 35-day partial shutdown to prepare for "an orderly reopening." 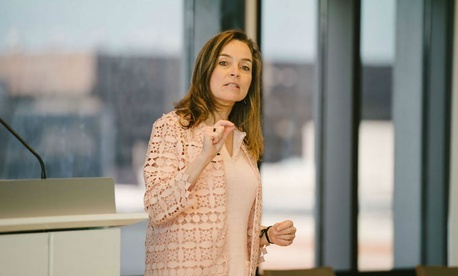 Office of Management and Budget Deputy Director for Management Margaret Weichert in a memo to agency heads told them to take steps in anticipation of reopening. Priorities include recalling furloughed employees, "restoring pay and benefits for employees" and ensuring access to equipment and information technology systems, she said. President Trump on Friday announced a short-term deal on a three-week continuing resolution that will fund agencies until Feb. 15, and Congress passed the measure later that day. Trump praised the federal employees who worked during the shutdown and promised back pay for those who were furloughed “very quickly, or as soon as possible.” The lapse in appropriations affected about 800,000 federal employees, with more than half of them required to work without pay and the others furloughed. Both groups will receive compensation once government reopens. Later on Friday after Trump signed the continuing resolution into law, OMB acting Director Russell Vought issued a memo officially declaring the government open. 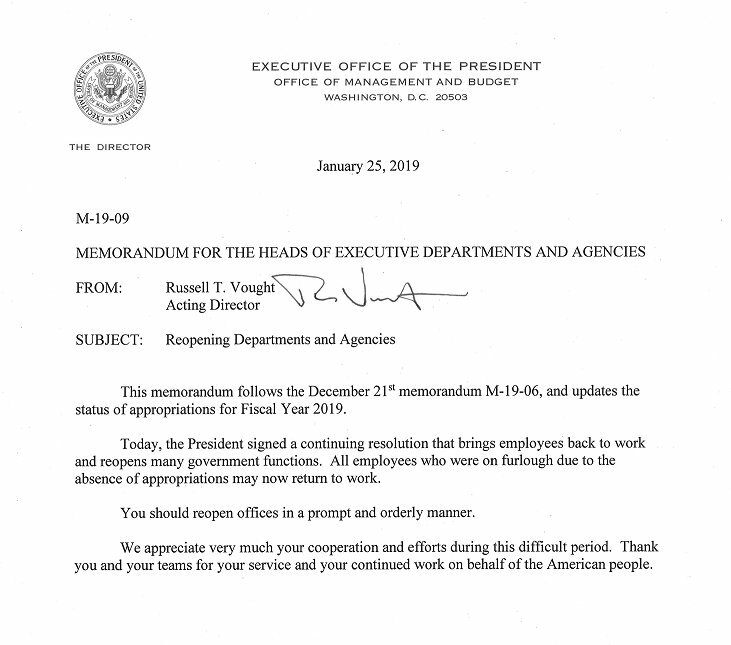 "All employees who were on furlough due to the absence of appropriations may now return to work," the message to agency heads stated. "You should reopen offices in a prompt and orderly manner. We appreciate very much your cooperation and efforts during this difficult period." OMB also issued a checklist to help agencies facilitate the resumption of operations. “The items in the checklist are high priority issues that agencies should consider in planning for orderly startup. This list is not an exhaustive list nor is it intended to be a directive,” OMB noted. The list details considerations related to communications with employees, getting employees paid as quickly as possible, prioritizing the workload and handling contracts.